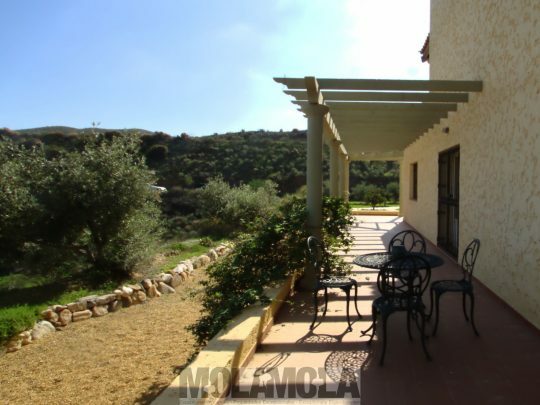 This eco villa with olive grove enjoys complete privacy and boasts impressive views to the lively village of Cariatiz. The house of 288 sq.m. 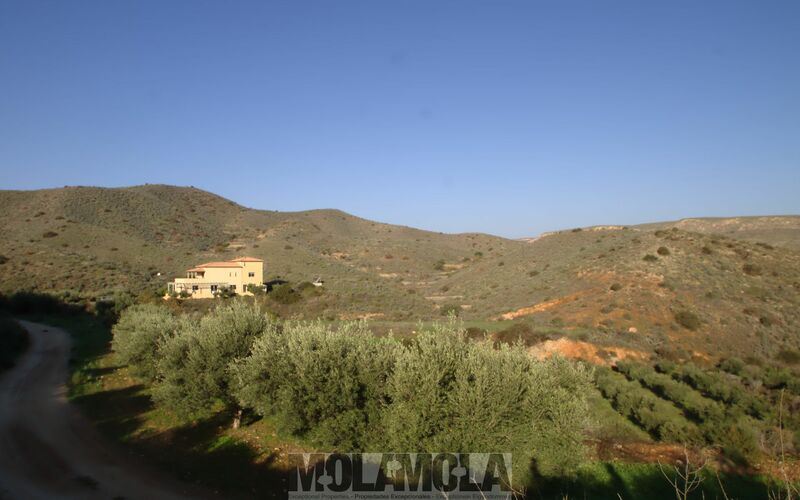 is surrounded by 10Ha of land. Most of the land is terraced, partly planted with mature olive trees. 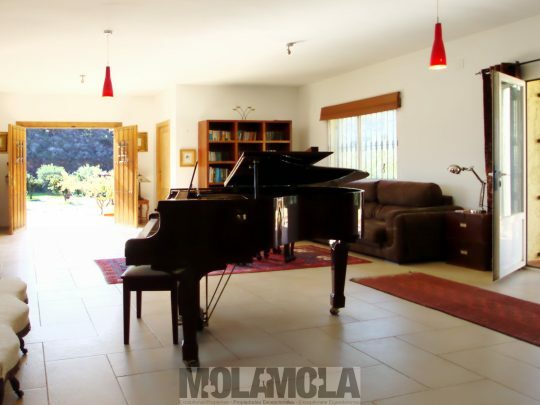 Its large flat terraces and the soil would make it a perfect equestrian property with plenty of tracks to discover in its immediate surroundings. 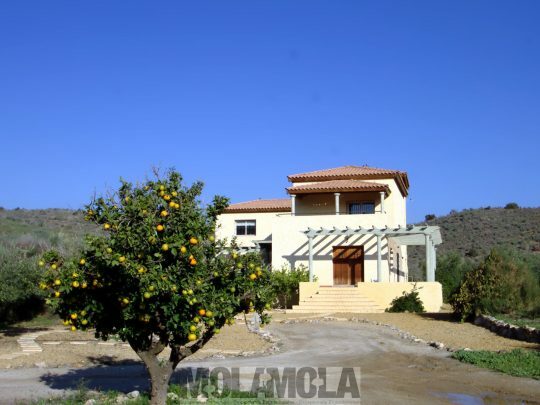 This could be an excellent eco villa, as the property is solar powered and has its own water. Currently, the villa’s well is not in use. 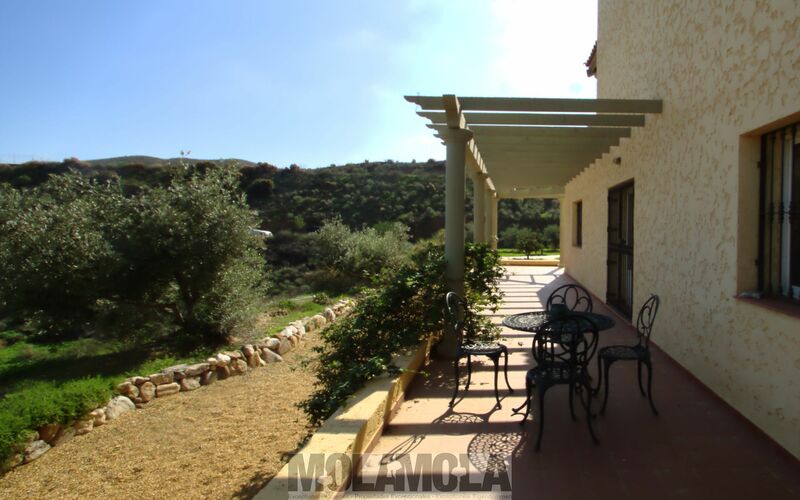 A private road passes by the olive groves onto the large parking area in front of the villa. 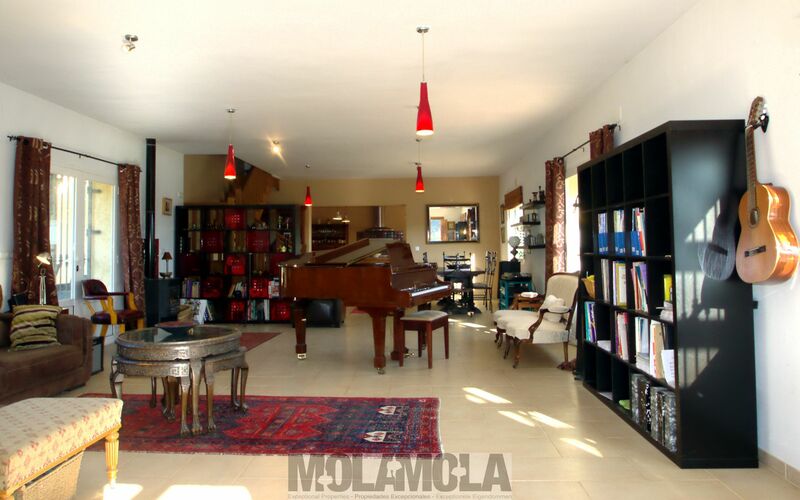 A staircase leads to the elevated terrace in front of double wooden doors that open up to a spacious living room. 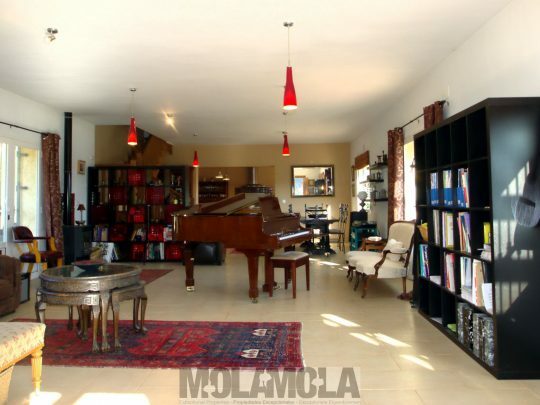 At the entrance of the room is a door to the cloakroom and in front is a bright lounge area with wood-burner, followed by grand piano, dining area and an office corner underneath an oak staircase. The room has french doors on either side that lead to the front terrace on one side and to the south-western exposed terrace in front of the pool area on the other side. 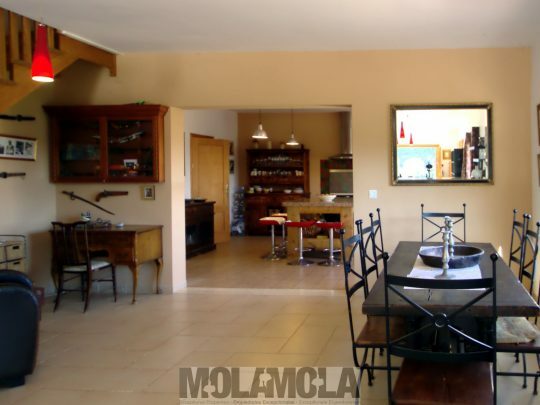 In continuance of the living room is an arched opening that leads to an open plan, country style kitchen with gas-stove, large breakfast island and utility room with laundry area.. The kitchen has direct access to the front terrace where you can have breakfast in the morning sun. Next to the kitchen is a small corridor that passes by a bathroom with shower and leads to a bedroom in front of the pool terrace. This sunny room is currently used as a TV/reading room. It has a wood burner in the corner and french doors that open onto the terrace. On the first floor is a spacious master-bedroom with plenty of closet space, an en-suite bathroom with shower and a private Southeast facing terrace. On the same floor is a triple bedroom that shares a bathroom with a double bedroom. 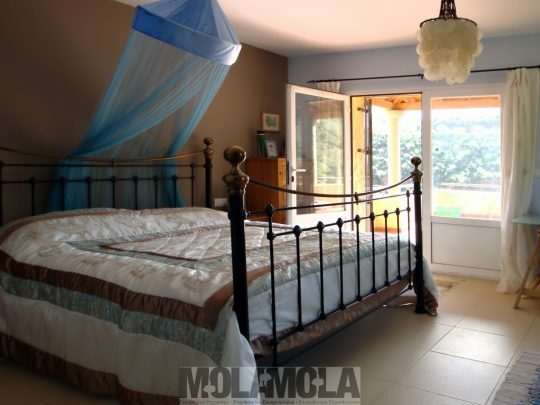 These bedrooms have very high ceilings and can be closed off from the rest of the floor. They have a private access via an outside staircase. Further on this floor are two smaller bedrooms and a bathroom. A retractable staircase gives access to an attic / loft space that could be used as further accommodation or a games room. 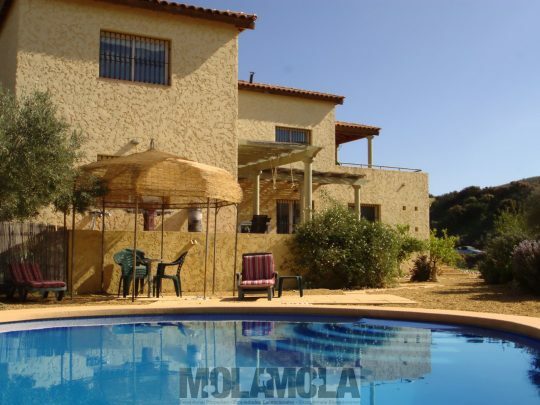 In front of the villa is ample parking space and a car port. 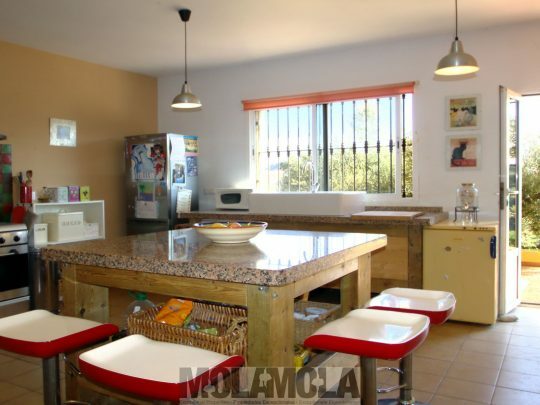 The terrain of this eco villa consists of 10Ha very private land. 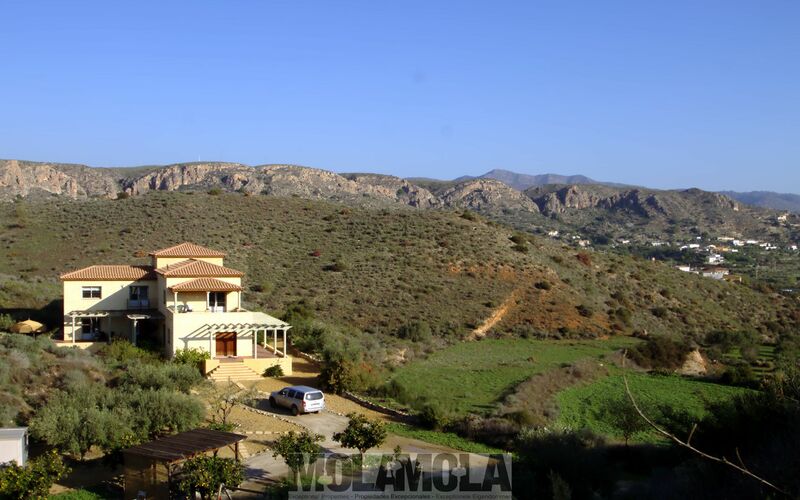 The land lies between two hillsides that meet behind the villa. 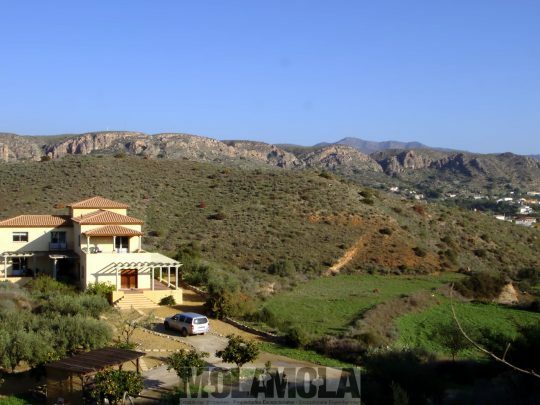 The villa itself stands on the highest point of the valley in between the hills. The valley beneath the villa is completely terraced. There are olive groves on two of the terraces. The olive grove can be extended onto the other terraces. The views over the green valley extend to the whitewashed village of Cariatiz, a hamlet of Sorbas. There is a freeform pool with sun terrace, tucked in the corner of the land, where the two hillsides meet. There are several terraces around the house that always provide either sun or shade. 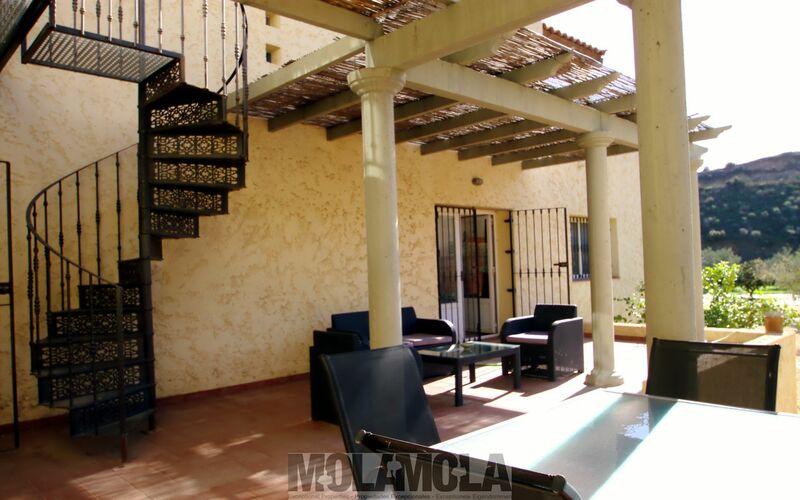 There is a covered terrace a few steps up from the pool terrace, adjacent to the living room and downstairs bedroom. 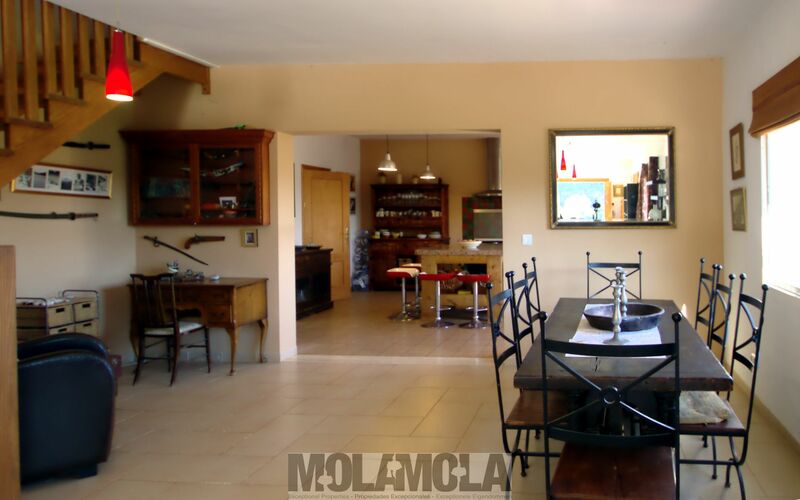 In front of the kitchen and also adjacent to the living room is another large terrace with magnificent views over the valley and the village. This terrace has a pergola structure and can be easily covered. 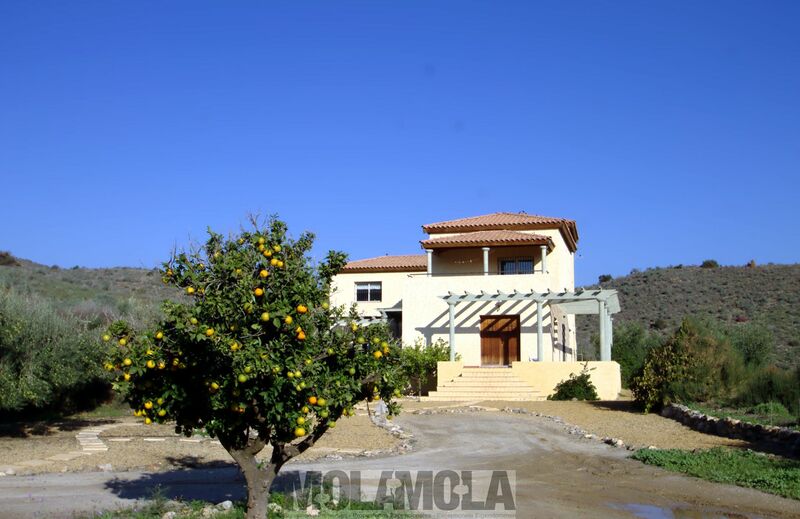 The area around the house is landscaped with paths, lemon trees and flowering shrubs. At the back of the house is a small garden. Here is a fenced area for the dog. 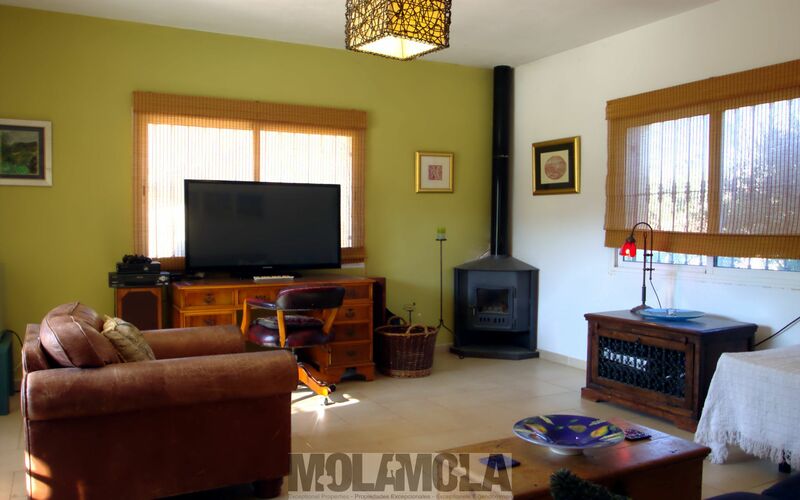 This is also the area where you can find all the necessary installations for the house: the gas-installations, photovoltaic panels, the battery area and a diesel emergency generator. 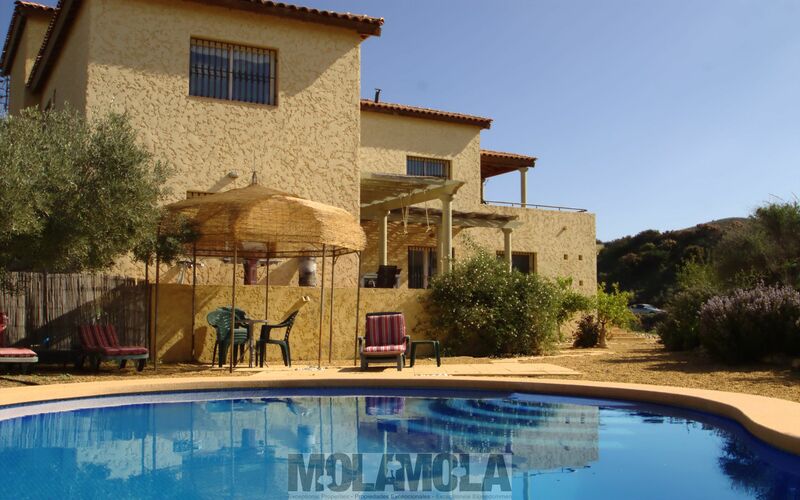 If you would like to be independent form the water company, this property has a well, as well as a small water reservoir about 100m from the villa. The basis provides water to the villa and to the orchards. 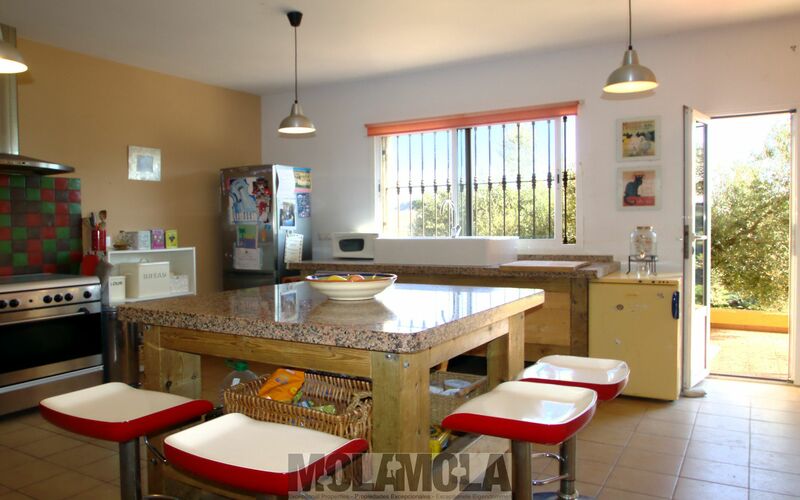 The property has solar panels and stores its electricity on batteries. There is an emergency diesel generator. 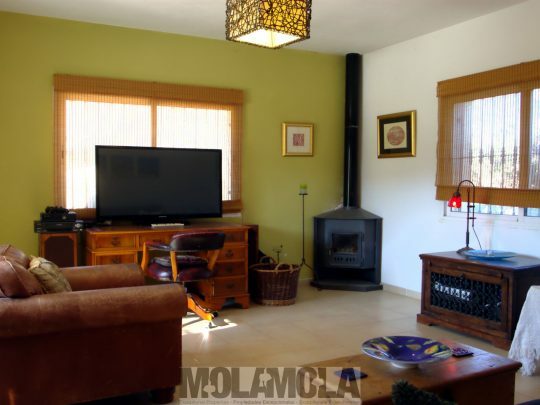 In the house, there is a gas cooker and oven. The gas is provided via large gas bottles, stored outside the house. The house is in excellent condition. Windows are made of aluminium with double glazing, mosquito blinds and shutters. 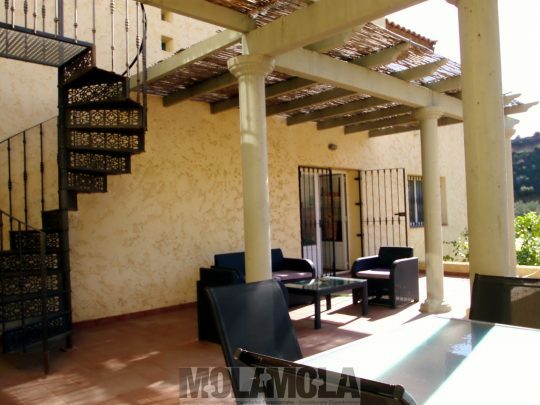 This villa is ideal for those looking for a permanent home or long periods of relaxation in the mild climate of Almeria. 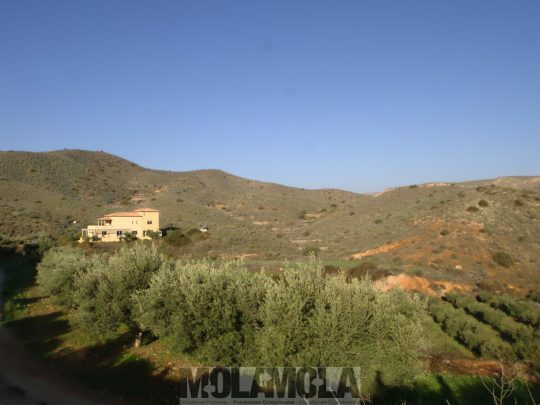 The olive grove can be your own project or you can let local farmers take care of the olive grove in exchange for olive oil. There is potential as a family home or a business opportunity. 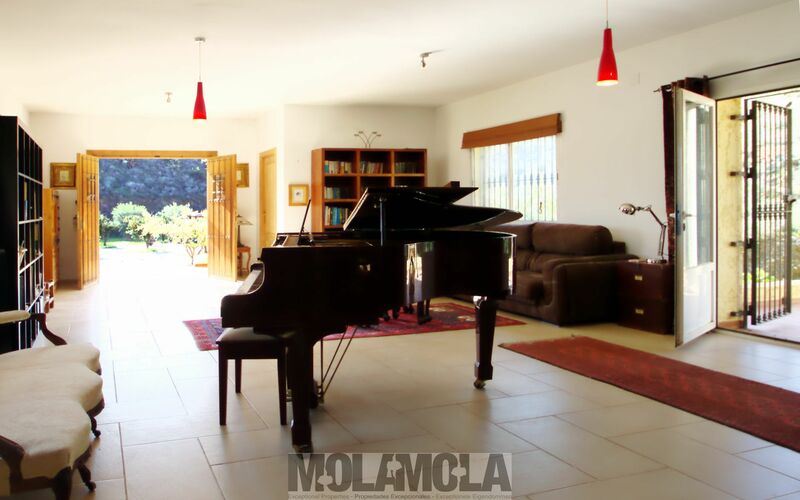 Although currently used as a family home the property would lend itself to further expansion as an equestrian property, rural guesthouse, farm house and/or other possibilities. 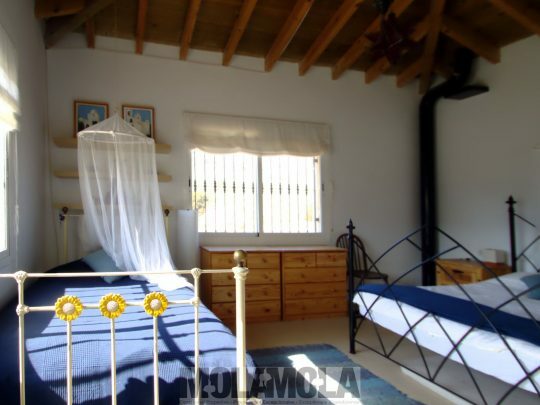 Access to the property is from a small public road onto an unpaved country road, well maintained by the town hall. About 600m onto this road, you drive around a hill and continue on the private road that leads to the villa. 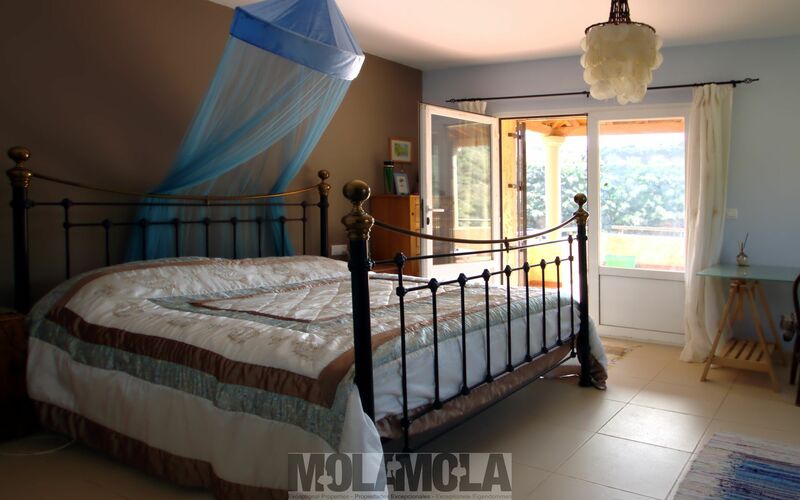 The property is completely secluded yet only two minutes away from the village with local amenities. 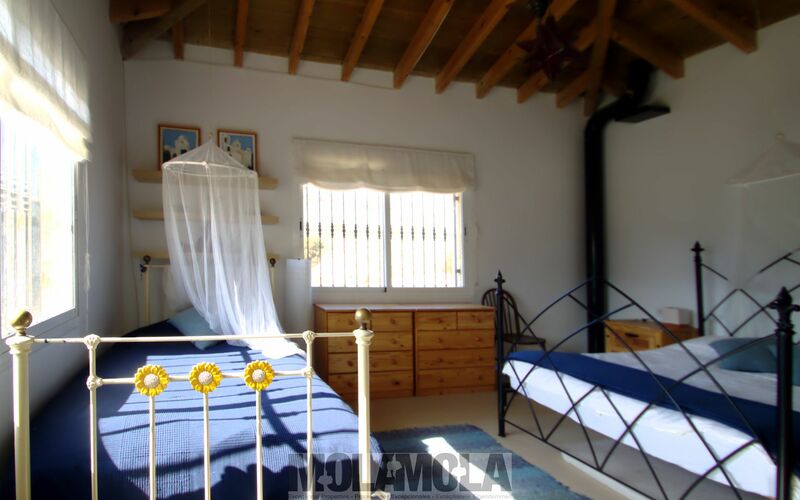 It is situated just 12 km from Sorbas, 15km from Los Gallardos, 25km from Mojacar and 27 km from the beach. The airport of Almeria is around 40 minutes away, while the airport of Murcia (150 km) is at one and a half hour and Alicante airport (200 km) is a two hours’ drive away.